Well, now you know the history, the location, and some mining vocabulary. 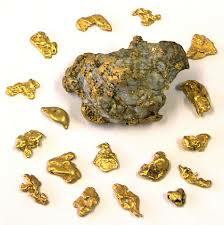 But if gold is so deep in the Earth, how do geologists find it? Watch the video, and take notes about how gold is found and mined. Use your notes to write an informational paper about what you learned. Add illustrations or diagrams to help tell your story. Click on the image for the video. Choose "How Gold is Produced".